Follow the directions on your page to fill in your table. 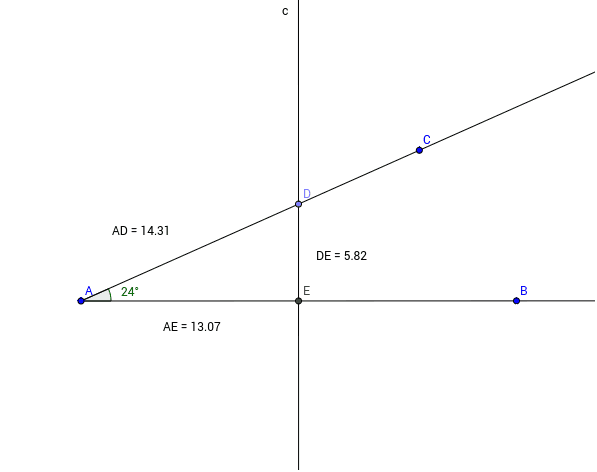 Move C so that angle A is an acute angle (but different from your neighbor). Record in your table. Record the distances of DE, AE, and AD. Calculate the ratios DE/AD, AE/AD, and DE/AE. Drag D along AC. What happens to the measure of ∠A as D moves? Repeat steps 2 and 3. Drag D to a third location along AC. Repeat steps 2 and 3.